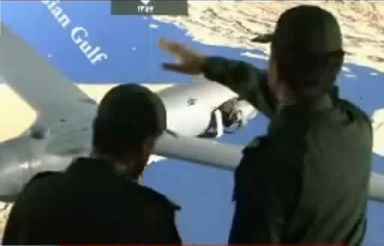 IRGC officers examine ScanEagle drone on Iranian TV. As the situation in Iraq deteriorates still further the New York Times tells only half the story. On the one hand the U.S. and its allies are training and arming Sunni extremists, in addition to financing them and supplying intelligence to help them evade Iraqi and Syrian security forces. However, the New York Times is notably silent about this aspect of the conflict. On the other hand though, it does deign to inform its readers that Iran is “secretly” assisting Iraq combat Sunni militants. As Iran recently returned Iraqi military jets it had held in lieu of reparations for Iraq’s having attacked Iran during the First Persian Gulf War 1980-1988, Iran’s assistance is hardly a secret. What will remain secret, for as long as the New York Times omits to tell its readers, is the fact that the U.S. and its allies are also secretly assisting the Islamic State of Iraq and the Levant (ISIL sometimes also referred to the Islamic State of Iraq and Syria ISIS). In fact Kurdistan’s security agency says it informed the CIA and MI6 about the ISIL/S’s plans to seize norther Iraq five months ago. The warnings went unheeded. Possibly because the U.S. had already been training ISIS/L militants at a secret camp in Jordan for just such a mission. The U.S. is playing a dangerous double game; grudgingly giving Iraq limited military aid while covertly assisting armed Sunni militants to oust the government of Prime Minister Nuri Kamal al-Maliki. In effect the U.S. is double-crossing Iraq and in this it is being assisted by the corporate media; like the New York Times, which is pointedly silent about the covert assistance the U.S. has been providing Sunni militants. Iran is directing surveillance drones over Iraq from an airfield in Baghdad and is supplying Iraqi forces with tons of military equipment and other supplies, according to American officials. The secret Iranian programs are a rare instance in which Iran and the United States share a near-term goal: countering the Islamic State in Iraq and Syria, or ISIS, the Sunni militants who have seized towns and cities in a blitzkrieg across western and northern Iraq. But even as the two nations provide military support to the embattled government of Prime Minister Nuri Kamal al-Maliki, they are watching each other’s actions warily as they jostle for influence in the region. Senior American officials emphasized that the parallel efforts were not coordinated, and in an appearance at NATO headquarters here on Wednesday, Secretary of State John Kerry highlighted some of the potential risks. “From our point of view, we’ve made it clear to everyone in the region that we don’t need anything to take place that might exacerbate the sectarian divisions that are already at a heightened level of tension,” Mr. Kerry said. Both the United States and Iran have small numbers of military advisers in Iraq. As many as 300 American commandos are being deployed to assess Iraqi forces and the deteriorating security situation, while about a dozen officers from Iran’s paramilitary Quds Force have been sent to advise Iraqi commanders and to help mobilize more than 2,000 Shiites from southern Iraq, American officials say. Gen. Qassim Suleimani, the head of the Quds Force, has paid at least two visits to Iraq to help Iraqi military advisers plot strategy. And Iranian transport planes have been making twice-daily flights to Baghdad with military equipment and supplies, 70 tons per flight, for the Iraqi forces. The Iranian involvement comes as Syria has intervened militarily by carrying out airstrikes in western Iraq against ISIS fighters, according to American officials, who said they could not confirm reports of civilian casualties. It is not clear whether Syria decided on its own to target ISIS or whether President Bashar al-Assad was acting at the behest of Iran or Iraq, the officials said. But it appears that Syria, Iran and the United States are all fighting a common enemy. “That’s one of the reasons why government formation is so urgent, so that the leaders of Iraq can begin to make decisions necessary to protect Iraq without outside forces moving to fill a vacuum,” he said. The Obama administration has sought to open a dialogue with Iran on the Iraq crisis. William J. Burns, the deputy secretary of state, met briefly last week with an Iranian diplomat at the margins of the negotiations over Iran’s nuclear program taking place in Vienna. But Western officials say there appear to be divisions between the Iranian Foreign Ministry, which may be open to some degree of cooperation, and General Suleimani, who was the mastermind of Iran’s strategy when Iraqi Shiite militias trained by Iran attacked American troops there with powerful explosive devices supplied by Tehran. 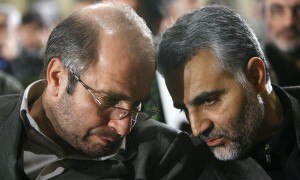 The general is also the current architect of Iranian military support in Syria for Mr. Assad. In the weeks since ISIS swept across northern Iraq, the United States has increased its surveillance flights over Iraq and is now flying about 30 to 35 missions a day. The flights include piloted aircraft, such as F-18s and P-3 surveillance planes, as well as drones. Mounting its own effort, according to American officials, Iran has set up a special control center at Rasheed Air Base in Baghdad and is flying a small fleet of Ababil surveillance drones over Iraq. An Iranian signals intelligence unit has also been deployed at the airfield to intercept electronic communications between ISIS fighters and commanders, said another American official, who, like the others, spoke on the condition of anonymity. The airfield may be the first former American base in Iraq to be used for Iranian operations. American forces used it after they invaded Iraq in 2003, and during the early phase of the occupation, an aviation squadron was based there, calling it Camp Redcatcher. While Iran has not sent large numbers of troops into Iraq, as many as 10 divisions of Iranian and Quds Force troops are massed on the Iran-Iraq border, ready to come to Mr. Maliki’s aid if the Iraqi capital is imperiled or Shiite shrines in cities like Samarra are seriously threatened, American officials said. ome officials said that about two dozen Iranian aircraft had been stationed in western Iran for possible operations over Iraq. The security crisis in Iraq was just one topic discussed in Mr. Kerry’s meetings with officials who have gathered here for a meeting of NATO foreign ministers focused on Ukraine and alliance issues. Afterward, he departed for Paris, taking the train with his staff because of an air-traffic control strike. On Thursday, Mr. Kerry plans to meet in Paris with the Israeli foreign minister, Avigdor Lieberman, as well as with Saad Hariri, the former Lebanese prime minister. But a major reason for the stop is to discuss Syria and the “grave security situation” in Iraq with his counterparts from Jordan, Saudi Arabia and the United Arab Emirates, a senior State Department official said. Michael R. Gordon reported from Brussels, and Eric Schmitt from Washington.